As a restaurant owner, you’re always thinking up new ways to market your business. You want to attract new customers and keep them as loyal patrons. You want to stand out from the competition and show diners what makes your restaurant special. Have you considered content marketing as part of your overall marketing strategy? Content marketing is a great way to keep your brand presence top of mind and give diners valuable information. I know, it may seem strange to use a marketing tactic that isn’t totally self-promotional, but it’s actually a really smart strategy when your goal is to organically invoke interest in your business. People don’t want to be constantly sold on why they should buy a certain product or visit a particular business. Persistent self-promotion of your restaurant can be overwhelming, contrived, and even irritating to potential customers. Instead, you want to inspire people to want to visit you because of the content you’re sharing with them. Maybe your blog post stirred up an emotion or made a reader laugh. Maybe a video taught them something new or inspired them. This type of response is far more memorable than a generic sales pitch or overly-persuasive gesture. The ability to provide people with useful and meaningful information is why content marketing has been an increasingly essential part of many companies’ overall marketing strategy. So, where do you begin? Start off by creating a blog on your restaurant website if you don’t have one already. 53% of marketers say blogging is their top content marketing priority; consider making it a priority of yours as well. A blog is an easy way to share content that can also be re-shared on your social media platforms and in email newsletters to customers. Not to mention, having a blog helps to boost your website’s SEO, which we talked about in another article. Featuring a blog as a key part of your website will give you a 434% better chance of being ranked highly on search engines. Why not put in the extra effort to get some valuable content on your website? When beginning your blog, map out a content calendar. You can start off with a list of topics you find relevant and then decide where on the calendar you’ll place them for publishing. Be strategic about when and how often you’re posting your blogs. Of course, the more content the better, but don’t bite off more than you can chew. It’s better to produce high-quality content less frequently than it is to push out blogs that are rushed just to fill the page. When it comes to topics, make sure the content is relevant to your audience. As a restaurant, it’d be pretty silly to write blogs about hardware advice or the current trends in fashion. Produce content based on the history of your business or recipes, put a personal opinion spin on current restaurant news, and write employee spotlights about your staff and customer spotlights about your loyal diners. All of these topic ideas are relevant to your industry and your audience but aren’t just selling diners on why they should come to your restaurant. If your blog content is compelling, you’ll inspire people to want to dine with you because of the information or entertainment you’re providing. Maybe they really love the history and uniqueness of how your restaurant got its name or want to meet your outstanding staff in person. These personal connections through content can not only give your restaurant a unique voice, but can help bring more people through your doors. Starbucks has their own “Starbucks Channel” for exclusive content. There, they share in-depth blogs about the locations where new coffee is sourced, video content, and even a “behind the green apron” series that highlights Starbucks employees. 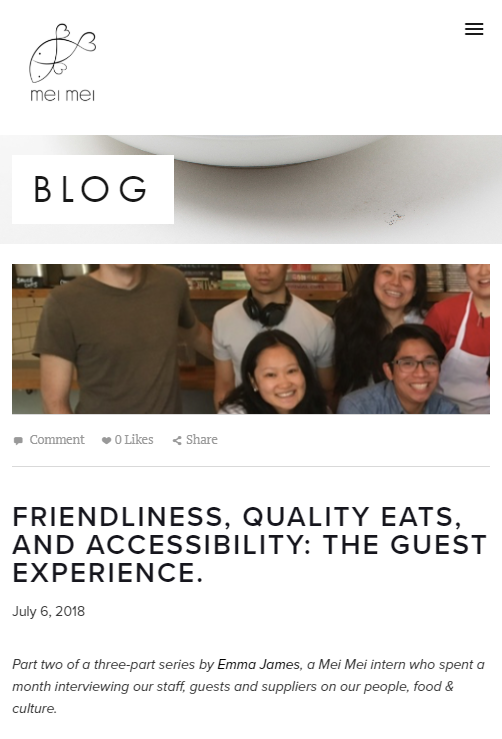 Mei Mei of Boston also has a specific blog page, where they post content about their employees, food, and even share recipes with readers. 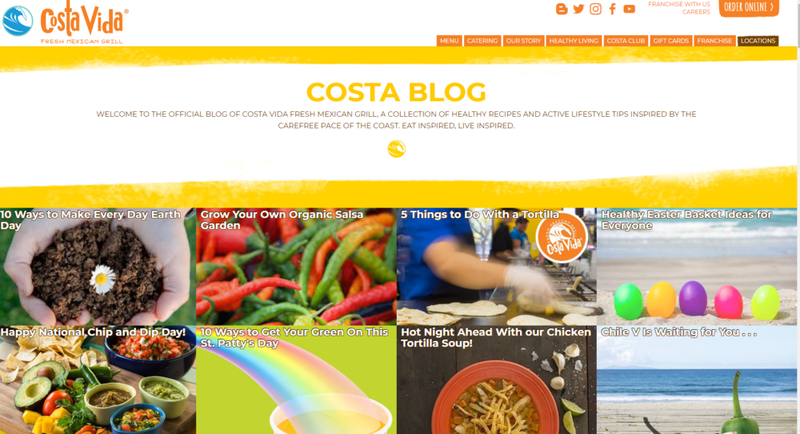 Costa Vida, a Fresh Mexican food chain, has a blog dedicated to ideas around holidays, ingredients, and more. Blogs should strive to be at least 1,000+ words, depending on the content. Google looks for quality over quantity. It wasn’t always this way, but with changes in algorithms, more is actually more! Although video may be somewhat difficult or time-consuming to produce, it can help you gain traction with a digitally-driven audience. The statistics support the fact that video works! Video posts on Facebook alone have 135% greater organic reach than photo posts. You can produce both short-form content for social media (Instagram allows for up to 60 seconds of video, Instagram TV can be longer), and longer videos to be placed on your company website and on YouTube. When it comes to any content, recycling is key. You can repurpose your blog content to produce videos on the same topics (for example, do video-based employee and customer spotlights). Publishing similar content in several different forms allows you to reach a larger audience and cater to people with different preferences. Although one person doesn’t want to read through your 2,000-word blog, they may be more inclined to view a two-minute video on the same topic. Brands like Insider Food have made a name for themselves by posting viral videos of restaurant hotspots and trending food dishes. Take some cues from their successful content and apply it to your own. Once you’ve created videos, experiment with paid advertising in order to boost the video visibility. The call-to-action on the videos can drive viewers to your website so they can learn more about your restaurant and what you offer. We really love the footage captured in this video about the Gordon Ramsay Restaurant Group. Just from the video content, you can see that the restaurants all have a different flair to them, but work together to form one cohesive restaurant group. Fire & Vine Hospitality is doing a great job with employee spotlights. This video showcases a captain at their restaurant, El Gaucho, which adds a personal touch and lets viewers get to know the staff. Typically, you can hold a video viewer’s attention for up to two minutes. After that, interest tends to drop off. So, try keeping your videos around this length (and produce shorter snippets for social media channels that have time constraints). We’ve talked about social media in a few other articles, but we’ll discuss it here as well. Chances are you’re already putting some effort into social. Facebook, Instagram, Snapchat, YouTube, and Pinterest are all great avenues to explore for restaurant marketing. Of course, not all of these channels are going to be a smash hit for your business – a lot of social media is made up of trial and error. Experiment with different types of posts, different social channels, and a few paid advertising campaigns to see what works for you. Establishing a clear brand persona on social media is important. Once you’ve gotten your feet wet, create a voice to go along with your restaurant’s brand, determine your restaurant’s unique style, and post consistent content that aligns with your brand. An ultimate win would be for someone to open up their Instagram, scroll through, and know that your restaurant posted a certain photo without even looking at the name of the account. This can be achieved through your unique style, the content within your post, and the language you use to describe the photo. Social media is also all about consistency. Posting an update once a year isn’t enough to keep followers engaged. Use a social media calendar to plan out your posts. An easy way to stay consistent is creating a cadence based on popular social topics. And don’t spread yourself too thin. If, after experimentation, you’ve discovered that Facebook and Instagram are the best outlets for your business, focus on them. Putting too much effort into social outlets that don’t give you any return is a waste of your time. Of course, high-quality, enticing photos are key (stray away from taking pictures on a flip phone). Studies have shown that people can recall 65% of the visual content that they see almost three days later. In comparison to about 10% of written content three days after it’s read. Draw people in with strong visuals, but with purpose. Do you offer a deal on pizza on Tuesdays? Post a hard-to-resist photo of your signature pizza pie on Monday night to let people know about the upcoming special. Adding a new item to the permanent menu? Photograph it in its most flattering light and update your followers on when the new addition will be released. People will be excited to learn about your restaurant updates through your creative posts. Playa Bowls started off as a one-location pop-up on the beach in Belmar, NJ. They serve up delicious, colorful, and healthy acai bowls along with other healthy food and drink. Since 2014, they’ve grown into a 50+ location chain. Their social media sticks to the laid-back beach vibe that was a part of their humble beginnings all those years ago. Playa Bowls’ aesthetic exudes a beach vibe mixed with customer appreciation. We also love the way they write their captions. The language is true to the brand and full of fun. Their social posts make you want to grab a friend & grab a bowl! ShakeShack has more than just amazing burgers, their social media is pretty great too. As if the drool-worthy food photos weren’t enough, they have pictures of dogs! We love the “dog days of summer pun,” and this campaign is part of a series of “Shack pups” that they’ll be sharing for summer. They also make it a point to be vocal about causes they care about – which shows the human side behind the burger! When creating a social media strategy, let your brand speak for itself. Don’t try to mimic other restaurants just because they have a large following or great pictures. Of course, you can take cues from brands who are #winning, but don’t forget who you are. You always want to show off your business’ uniqueness and let that shine through. Content marketing is a powerful tool for any business. This form of marketing is educational, informative, and less “salesy” than other traditional marketing tactics. Providing your potential diners, loyal customers, and social followers with valuable content helps to establish your restaurant’s credibility and trustworthiness. Plus, it helps you stand out from the competition; you’re giving people more useful information than they may have expected from a restaurant. There are many ways you can accomplish successful content marketing, from blog posts to video and social efforts. Make sure you have a solid plan in place before executing; take advantage of content marketing and social calendars to help you plan accordingly. Be original and get creative; if you let the true colors of your unique brand shine through, you’re sure to make a memorable impression.